Members can exhibit their work. This includes YOU! Our 15th National Exhibition travelled to 8 museums from October 2011 through July 2013, starting at the Cornell Museum of Art and American Culture, Delray Beach, FL, going to the Mobile Museum of Art, Mobile, AL, the Art Museum of Southeast Texas, Beaumont, TX, the Art Museum of South Texas, Corpus Christi, TX, the Museum of the Southwest, Midland, TX, The Haggin Museum, Stockton, CA, the Coos Art Museum, Coos Bay, OR and finishing at the Minnesota Museum of Marine Art, Winona, MN. Earlier National Exhibitions were hosted by: The Peabody Museum, Salem, MA; The Mariners’ Museum, Newport News, VA; The Maryland Historical Society, Baltimore, MD; and the Mystic Maritime Museum, Mystic, CT.
As a Regular Member you are also able to submit to our Regional Exhibitions, which are juried every 3 to 4 years in the Society’s four different regions in the United States. Recent Regional Exhibitions include "Cruising Southern Waters" hosted by the Quinlan Visual Arts Center in Gainseville, GA, "Between the Shining Seas" hosted by the The Wisconsin Maritime Museum in Manitowac, WI and the Minnesota Marine Art Museum in Winona, MN; and "Blue Water / Still Water" which opened at the Biggs Museum of American Art in Dover, DE, moved to the Washington County Museum of Fine Arts in Hagerstown, MD and closed at the Buffalo Naval and Military Park in Buffalo, NY; and the "Coos Bay Regional" held at Oregon's Coos Art Museum. 2. ASMA News: Our full color quarterly newsletter alerts you to Society information and activities. Our quarterly newsletter..ASMA News..will keep YOU in touch. When you join, you’ll receive the Society’s quarterly newsletter, ASMA News. This will keep you up to date with all of the Society’s activities, along with providing space where artists like yourself can share ideas, inspirations, tips and even frustrations. The ASMA News provides you access to the Society’s network of members, local and national marine art news and information about art exhibitions and exhibition opportunities. 3. National Marine Art Conference - New to ASMA as of 2016, the Society puts together a wide array of art programs and demonstration to provide learning opportunities to our membership. NMAC will be take place in conjunction with our brick and mortar National Exhibitions. 4. Annual General Meeting: All members and their guests are welcome and encouraged to attend this gathering . As a Member, YOU will be invited to our Annual General Meeting. ASMA Members and friends have met for the Society’s renowned Annual Weekend Meeting held in different parts of the country. In 2006 it was held in Cape May, NJ and in 2007 in Santa Barbara, CA. In 2008 it was held in conjunction with our 30th anniversary in Wilmington, DE and Philadelphia, PA. In 2009 it was in New Bedford, MA, in October 2010 it was in Sarasota, FL, in 2011 it was in Savannah, GA., and in 2012 it was in Mystic and New London, CT. During these three to four day gatherings, we share ideas and get to know each other. We speak freely about our work, learn from others, listen to guest speakers, and even show some of our latest paintings. The best part is that we all have fun, make lasting friendships and develop networks of working relationships. Annual Weekend Meetings will take place on years that the Society does not hold a National Marine Art Conference. Click Here to see our Photo Galleries of our past Annual Weekend Meetings. YOU can learn a lot about marine art and painting from active artists. Not only will you rub shoulders with some of the best contemporary marine artists working today, but also you will learn technical information on subjects such as materials, mediums, techniques, and methods of painting or even how to get inspired. When you join, you’ll ask questions, get answers, watch demonstrations, make your own contribution to the discussion and see some great marine art created! 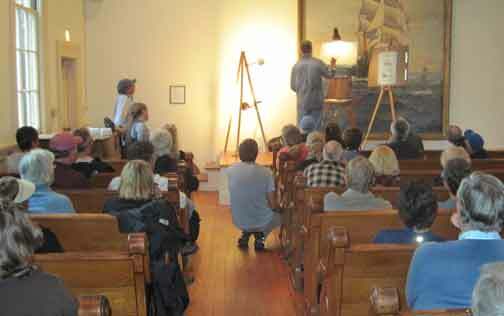 During the 2012 ASMA annual weekend in Mystic Seaport (below), Don Demers offered a fine painting demo that kept members entranced while he kept up a lively running commentary. Anyone interested in marine art and history can join. 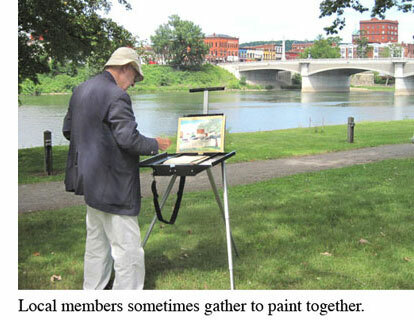 You do not have to be an artist to join the Society. Any American citizen living in the U.S. or abroad interested in the recognition and promotion of American marine art, past or present, is welcomed to join. Since the Society is recognized by the Internal Revenue Service as a 501.C. 3 not-for-profit organization, all contributions are tax deductible. We are an educational organization, founded to increase public appreciation of the role marine art has played in American art & culture. There are five regular classifications of membership. First, is Regular Membership. Most people initially join as Regular Members and pay $65 annual dues. 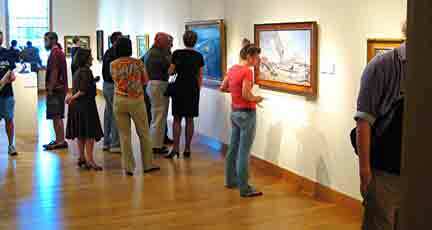 Galleries and museums are invited to join as Regular Members. The second classification is Signature Member. Individuals who are interested in becoming a Signature Member may digitally submit a portfolio of their marine art to Annual Jury Review held by the Society’s Fellows each spring. You can get details on how and when to do this if you click here. Members who apply to become Signature Members and are accepted by the Jury of Fellows, are entitled to signatory privileges and are allowed to use the acronym ASMA after their signature on paintings, promotional literature, business cards and elsewhere. The annual dues for Signature Members is $100. The third membership level is Sustaining Signature Member. This is available only to those members who have been a Signature Member for at least 30 years, or are age 80 and above. Sustaining Signature Members are not required to submit for the Society's National Exhibition. Dues are $65.00 annually. The fourth level of membership is Fellow, and is limited to a select group of highly skilled marine artists. To be considered for Fellowship, you must first be a Signature Member. Dues are $125.00 annually. Fifth, is our Student Member category for young maritime artists. Annual dues for this category are $15. 7. Color Exhibition Catalogs: Catalogs of our National Exhibitions are first made available to members. Members of the Society are the first to learn about the availability of new National Exhibition Catalogs. Once the offer has been extended to the Members, the catalogs are made available to the public. Catalogs for previous National Exhibitions are still available and can be obtained if you click here and scroll down to "Other Fees". A copy of each National Exhibition is filed with the National Library of Congress and other archival and copyright institutions.